Spring is here - bringing with it a sense of renewal, warmer weather, more daylight hours, special events, and graduations as we welcome many new members into higher education and/or the workforce. In this issue we'll highlight some of the awesome things you are doing in North Carolina to help us "Spring into STEM" this year. For example, Students@Work Month is currently underway throughout the state. The NC Science Festival kicks off in April. We're also pleased to announce this year's recipients of the Career Award for Science and Mathematics Teachers in North Carolina. View CASMT honorees. You can learn more about the 2019 North Carolina International Science Challenge here. And, there's still time to apply for Student STEM Enrichment Program (SSEP) grant awards now through April 16. Finally, if you're looking for great seasonal STEM jobs this summer or more a permanent career, there are currently more than a dozen jobs listed in the Job Seekers section of the NC STEM website. Quick, easy, free site registration required. Spring is an exciting time for STEM education in North Carolina! 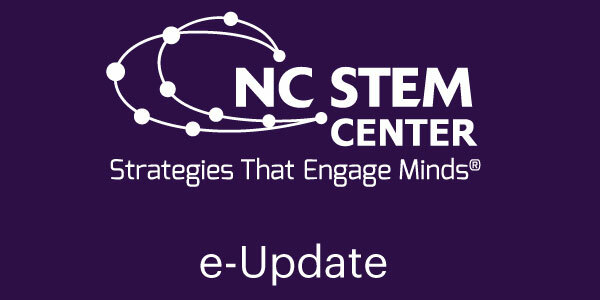 Please enjoy your NC STEM e-Update. Tweet us @NCSTEM with your suggestions, feedback, or thoughts about this issue or future ones. Karen Keskulla Uhlenbeck has received the 2019 Abel Prize for her extraordinary contributions to the field of mathematics. She is the first woman to be awarded this top honor in mathematics, which will be presented to her at an award ceremony in Norway on May 21. The North Carolina School Superintendents’ Association (NCSSA) and the North Carolina Alliance for School Leadership Development (NCASLD) has announced the selection of the following as the recipients of the Dr. Samuel Houston Jr. Leadership Award. Meghan Sauer has joined the NC Center for Afterschool Programs as STEM Coordinator. Learn about the appointment and more in the latest issue of the NCCAP Afterschool Observer. UNC Wilmington and Cape Fear Community College are hosting their first collaborative forum for Women in Science and Engineering (WISE) on March 22, at 4 p.m. at CFCC Union Station U170. The conversation is open to the public. Learn more. Click or tap the button below to view more programs at NC STEM Center. Take off into science at "STEM on the Wing Day" next month at the Carolina Raptor Center presented by MSC Industrial Supply Co. Exercise your brain and explore your inner geek at this free celebration of STEM on April 13. Learn more. Click or tap the button below to view all the great STEM opportunities at the NC STEM Center. NC STEM partners with The Connectory to help you discover local STEM happenings. Please visit Events Calendar to find these and more upcoming events. The Kenan Fellows Program for Teacher Leadership is designing a better future for K-12 STEM education in North Carolina through its business-education partnerships. You can participate in NC State's first Day of Giving on March 27. Learn more. Rowan-Cabarrus Community College invites you to its eighth annual STEM Open House on Thursday, April 4, from 5 to 8 p.m. in the College’s building located at the North Carolina Research Campus. Learn more. NCEast Alliance will host the 2019 State of the Region on April 4 at the Greenville Convention Center. The Keynote speaker will be Stephan Turnipseed, EVP of Pitsco Education, former CEO of LEGO and past chairman of Partnership for 21st Century Learning. More details and information will be coming soon. Stay informed at www.nceast.org. SYNERGY Conference 2019 is set for April 24-25, 2019 at the Khoury Convention Center Sheraton Greensboro at Four Seasons. Learn more. The leading conference gathering thought leaders and practitioners from education, technology, policy, and foundations will be held at the Santa Fe Convention Center in New Mexico this October. Learn more. Have STEM News or Event to Share? The NC STEM Center is a web portal for all things related to science, technology, engineering and mathematics in North Carolina. It is a project of North Carolina SMT Center in collaboration with N.C. Department of Public Instruction, North Carolina Community College System, UNC General Administration, Burroughs Wellcome Fund, and others. You have received this email because you have subscribed. If you no longer wish to receive emails, please unsubscribe. Thanks for your continued support.